Scot Russell Knox raced into a share of the first-round lead at California's Pebble Beach National Pro-Am event. The 27-year-old, who recorded two top-10 finishes last season in his debut year on the PGA Tour, carded eight birdies in a six-under-par round of 64. Knox, playing at Monterey Peninsula - one of three courses used in the event - is level with American Hunter Mahan, who hit a six-under 66 at Pebble Beach. Greg Owen is joint-third, with fellow Englishman Lee Westwood a shot behind. Owen fired a five-under round at Monterey as Westwood carded a four-under-par 68 at the famous Pebble Beach links. 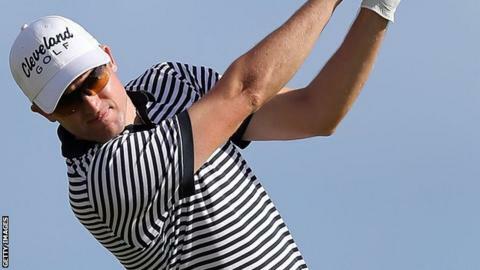 Westwood, competing in his first tournament of a year where he will play on the PGA Tour full-time, was satisfied with an opening round that included five birdies. "There's a long way to go but I'm off to a nice start, a 68, and I don't think that does you any damage on any of these golf courses," said 39-year-old Westwood.